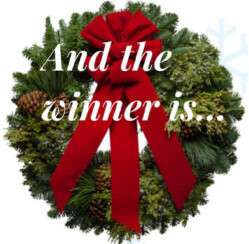 Winner of Christmas Gifts Contest | Who Won the Cascade Christmas Wreath by Christmas Forest? Who Won the ChristmasGifts.com Christmas Wreath Contest? Home » Article of the Week » Who Won the ChristmasGifts.com Christmas Wreath Contest? It’s time to announce the winner of this year’s first Christmas giveaway from ChristmasGifts.com! One lucky person has won this gorgeous and luscious fir and pine wreath from Christmas Forest. If you entered to win the giveaway, keep reading to find out who won this beautiful wreath from a company that has been crafting these festive wreaths since 1976. This wreath really does embody Christmas spirit entirely. It is made of noble fir and princess pine, adorned with pale yellow incense buds and pastel blue juniper berries, all topped with a beautiful big red bow! It measures twenty inches, and is ready to be shipped to your door where you can proudly display it and bring Christmas cheer to all who see! This wreath will welcome all guests with holiday spirit, and put a smile on the faces of passersby, spreading Christmas warmth to everyone. So, if you didn’t win this time, you can still order this wreath to spread some holiday cheer! So, without further ado, the winner is… Heather Cowley! Congratulations, Heather! We will attempt to notify you via private message, and we hope you enjoy your free wreath! Merry Christmas! For all those that entered and did not win, don’t worry! Our second contest of 2017 is still open, you can read about it here, and we hope you have a merry, merry Christmas! Congratulatios Heather for winning the contest!